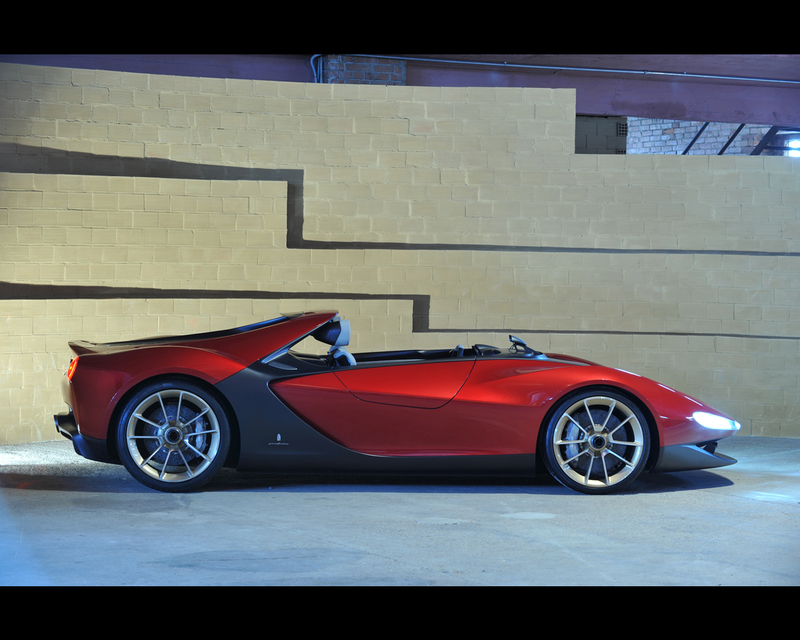 The Pininfarina Sergio barchetta concept is based on a Ferrari 458 Spider. 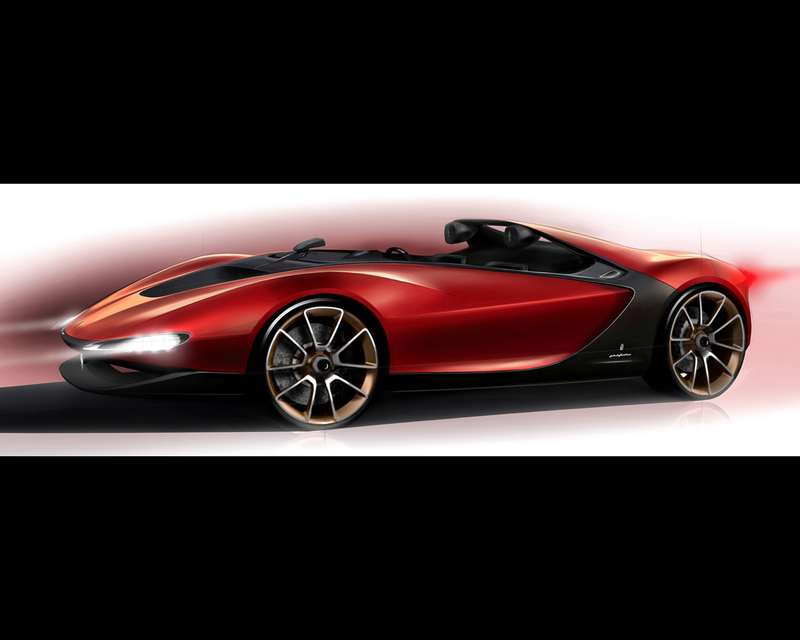 The new Pininfarina concept car could only be called Sergio. It is an exercise that Pininfarina decided to undertake on a brand that more than any other has marked the history of Pininfarina: Ferrari. 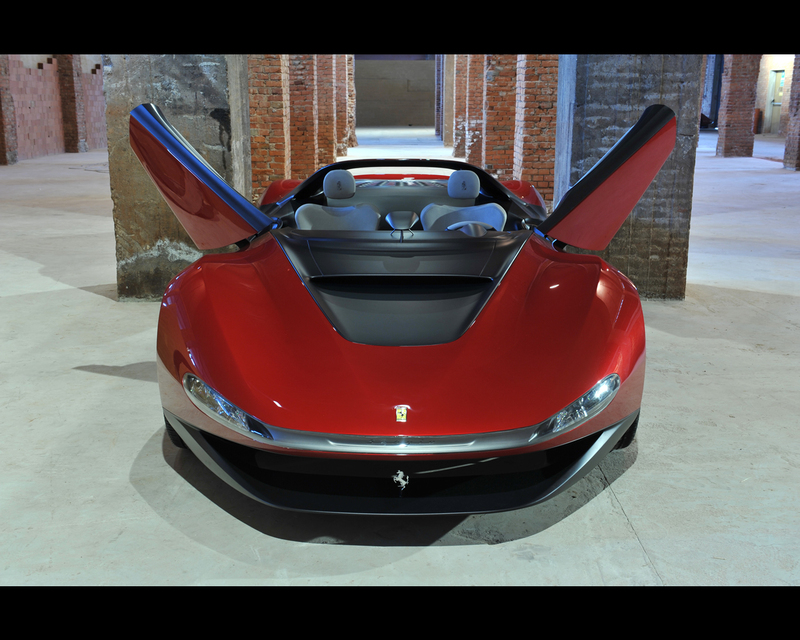 The name of Sergio Pininfarina is inextricably linked to that union conceived 60 years ago: the Sergio, therefore, will also celebrate the importance of Pininfarina's contribution to the history of Prancing Horse design. The sports car theme is built into Pininfarina: the fruitful collaboration with Ferrari which began in 1952, has generated some of the most popular sports cars of the postwar period. 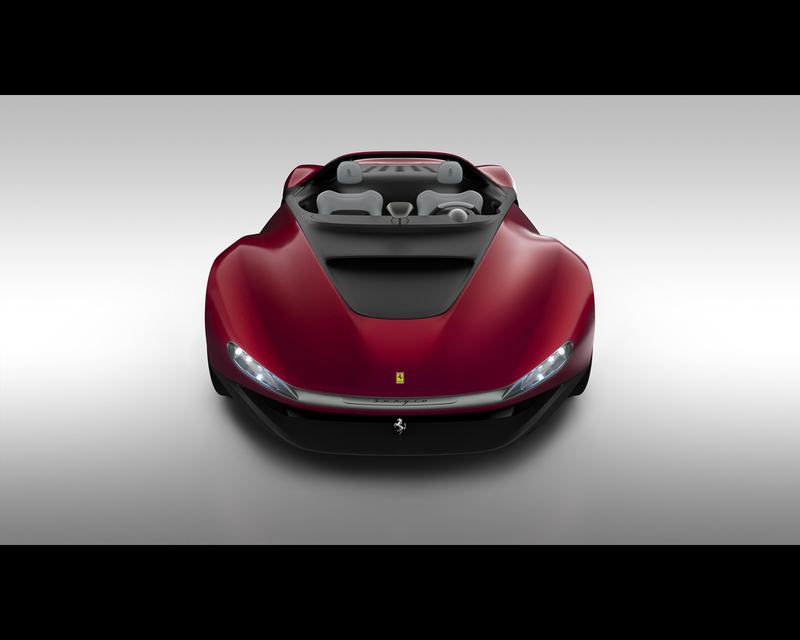 Returning to the charm of the two-seater Ferrari, compact and very sporty, is moreover, the perfect base for bonding Pininfarina's past to the future. 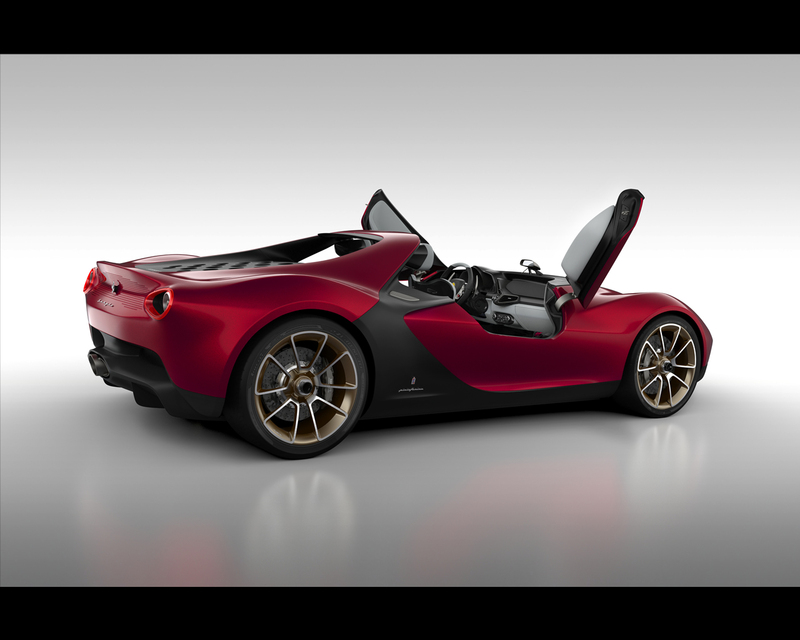 The Sergio's mechanicals are those of the 458 Spider, which remains unchanged in its wheelbase and tracks. The formal interpretation, from which the dynamic, fluid and pure volumes spring, is absolutely free, in the best tradition of that Pininfarina design vision that has produced so many Ferrari-based concept cars recognised over time as masterpieces, such as the Mythos of 1989 and the Rossa of 2000. 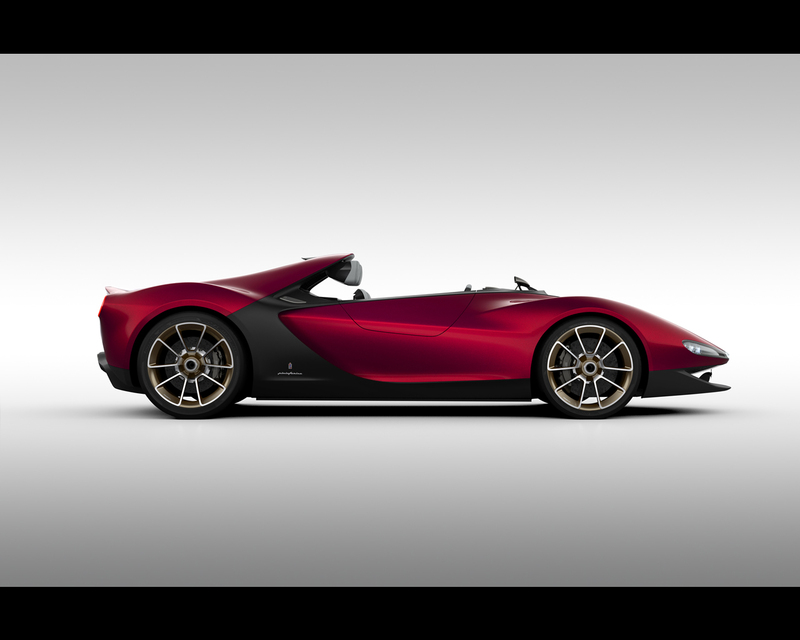 This approach also reminds us of Pininfarina’s Ferrari-based custom-built cars such as the Testarossa Spider made for Giovanni Agnelli in 1987 or the Ferrari F360 Modena Barchetta in 2000 for Luca Montezemolo. 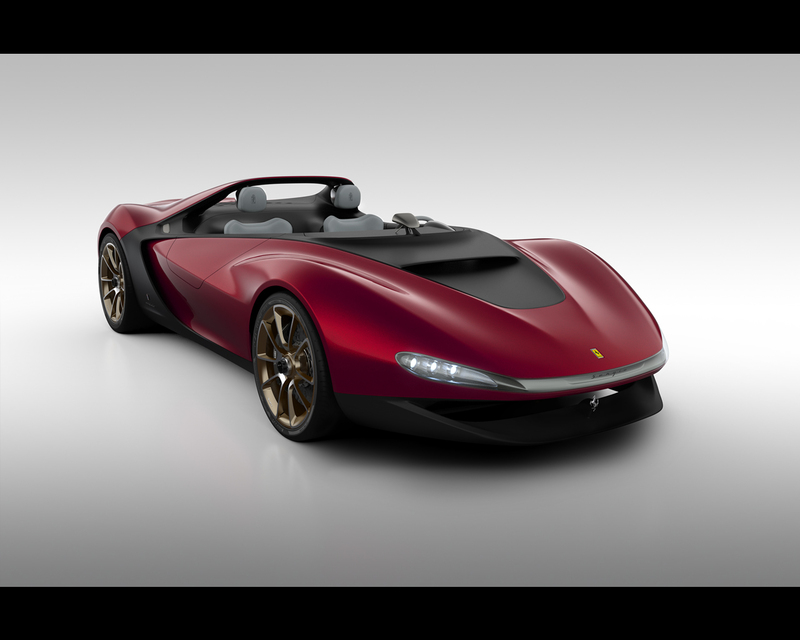 The result is a modern, organic view of the mid-rear-engined two-seater barchetta. The willingness to revisit volumes and surface treatments in a subliminal way emerges with the Sergio, which evokes the spirit of Pininfarina's best achievements for Ferrari of the ‘60s and ‘70s: a radical object, unique and essential, which rejects the superfluous and is performance-oriented. A real open air car with an explicit nod to racing cars, in the sense that a cupola is not fitted to protect occupants, for which two helmets are provided. The Sergio is distinguished by a very simple and clear style. 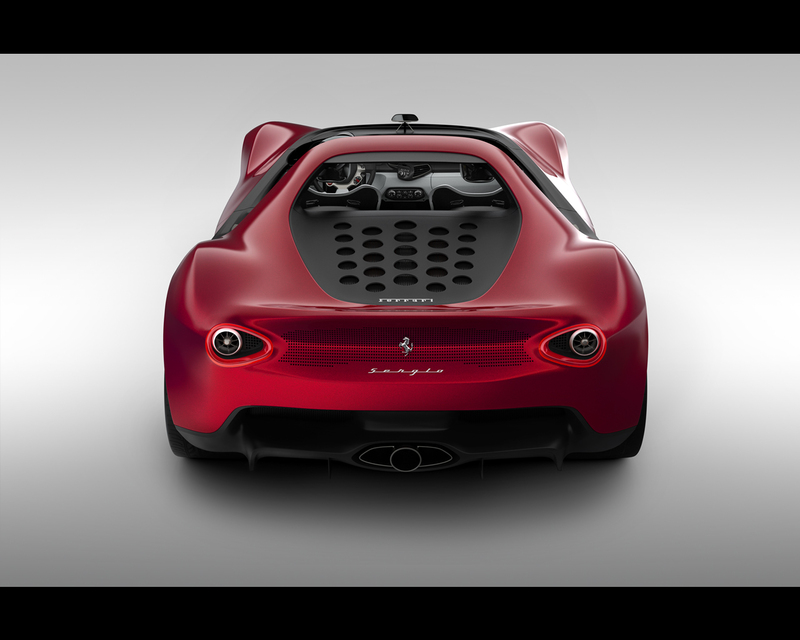 Proportions pushed to the extreme, a dynamic front volume penetrating into a rear that is projected forward, a sculpted, three-dimensional interpretation of the typical barchetta. The composition of the two body masses through a longitudinal black insert becomes the design's guideline. Two volumes enfolding from the outside to the inside the car create a division-union line between rear and front. Through the extremely fluid passage from one body to another, a form that was homogeneous in its accentuated muscularity was obtained. 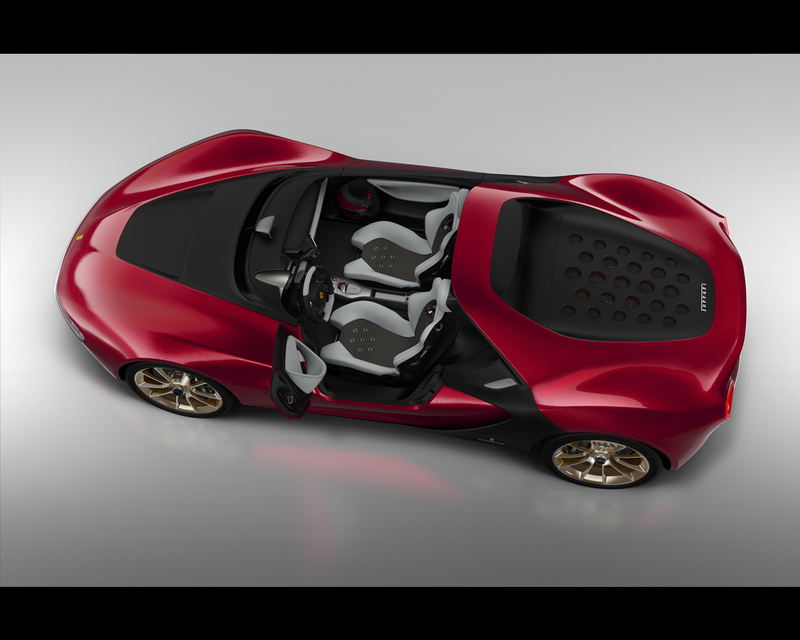 The extreme lightness of the Sergio, which appears to float with the front up, is a direct result of aerodynamic research. In the purest Pininfarina tradition, design is not an end in itself, but integrates functionality and aesthetics. The front semi-floating development with the spoiler under the front expresses aesthetic force and is at the same time functional for the stabilisation of the aerodynamic load and the heat exchange. The aerodynamic deflector in front of the cockpit also creates a virtual windscreen through the deviation of the air flow, protecting the passengers from turbulence. The roll bar, designed as a wing surface, is perfectly tuned to the evolution of the flow coming from the front, adding a further down force effect. Finally, the rear nolder and the extractor close the design effectively and functionally. Still on the subject of aerodynamics, even the rear-view mirror takes on a fluid form that, given the flow of the front baffle, helps to divert air from the heads of the passengers. 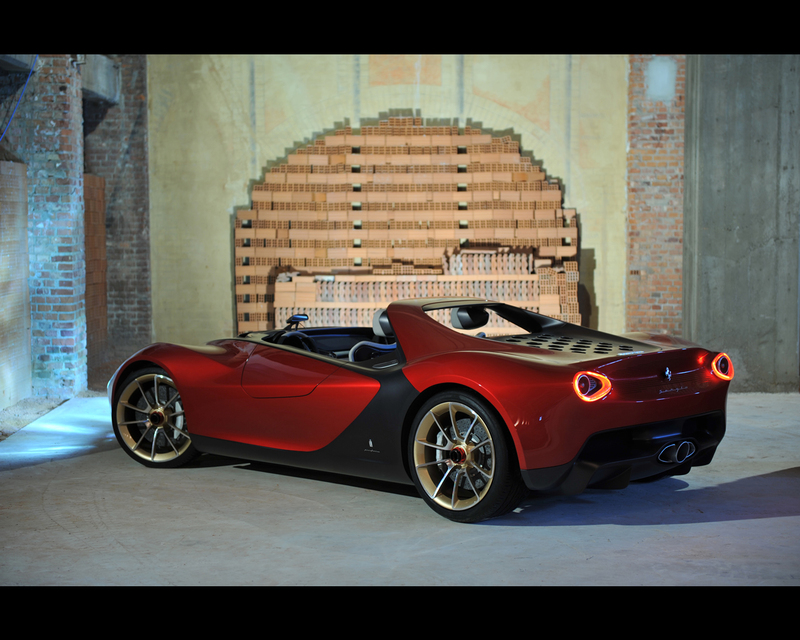 Since this is a realistic car that could easily be produced in limited series, the Sergio opted for the mechanicals of a completely re-bodied Ferrari 458 spider, maintaining the original technology and its performance. For this reason, the interiors take all the functional parts of existing series (dashboard, seat structure, centre console and steering wheel). The interior is essential and functional and develops as a natural extension of the external surfaces: the black exterior slips into the car and creates the tank where the standard technical components are integrated. Even the engine bonnet descends inside, wrapping round the rear part of seats. The door panels integrate the functions of the handle and armrest and are designed as floating elements separate from the tank. 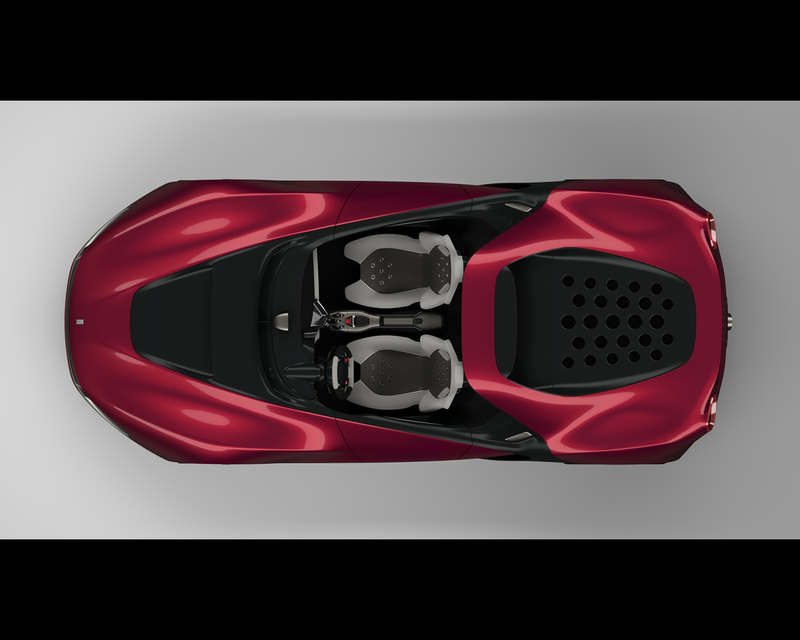 One innovative element consists of the floating, aerodynamic headrest connected to the roll bar rather than to the body of the seats, almost becoming elements of the exterior than the interior. Besides ensuring maximum purity of the lines, this solution also acts as head fairing in the rear. In front of the door panel, two helmets are housed in a small recess of the channel. Made to a specific design of Pininfarina Extra in collaboration with Newmax, the Sergio helmets are personalised with the colour of the car body. The aerodynamics have made it possible to achieve interesting results, starting with the creation of a virtual windscreen. The elimination of the windscreen would, in fact, involve a flow of air at increasing pressure as the car’s speed increases on the heads of the driver and passenger. 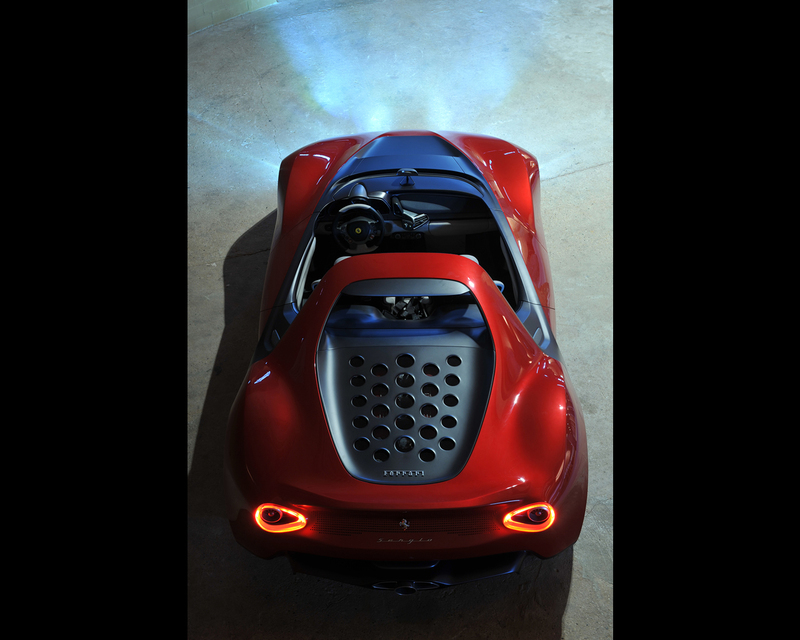 The engineers and designers at Pininfarina have therefore designed, built and tested an airfoil placed in a recess on the front bonnet, which produces a double deflection of the air flow entering the passenger compartment. The first deviation is from the wing itself, the second from the air that accelerates in the channel created between the airfoil and the corresponding shape of the recess in the trunk. The result is that, thanks to the virtual windscreen, the air passes above the heads of the driver and the passenger, greatly increasing comfort. This aerodynamic effect also contributes to increase the down force on the car's front axle. The virtual windscreen is effective at speeds as low as 50 kph. The loss of aerodynamic load on the front axle, due to the elimination of the windscreen, has been recovered from a wing inserted in the front bumper. The shape and dimensions of the wing are calculated so as to give the required load at the various speeds and, at the same time, allow correct flow of air to the radiators of the cooling system, set centrally at the front. To improve the protection of the occupants a roll-bar with a fixed spoiler increases the down force on the rear axle. The attention to detail goes so far as the central rear-view mirror, whose form has been aerodynamically optimised to link up with the air flow of the virtual windscreen. The engine's air intake is channelled from the air inlets in the two sides. The air vents at the base of the roll-bar convey the cooling air to the oil coolers.